The customer sent this ECU to us because the vehicle is smoking excessively and missfiring. A local garage diagnosed the fault with a fault code relating to ‘Power Supply To Coilpack’. The unit was sent in for ECU Testing and Repair. We testing the ECU and found the unit is functioning correctly, all the injector drivers were okay and we were able to fully simulate all ECU functions as though the unit was fitted to the vehicle. We cleared the codes and ran the ECU for over 24 hours on a testing bench and the unit passed with no logged faults. The ECU was returned to the customer as ‘No Fault Found’ and the customer was charged a small testing fee. An auto-electrician later found a wiring fault when carrying out a wiring continuity test, all problems fixed. The Mercedes Vito 2.2CDi is fitted with a Bosch EDC15C0 Engine ECU. 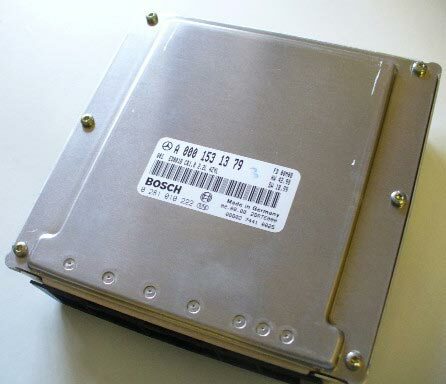 We’re able to fully test & repair this type of ECU unit so whatever the fault, we can fix it. If you have a Mercedes ECU fault, then get in touch today. You can email us, drop in or call us on 0208 853 5000. This entry was posted in Repaired ECU's and tagged Mercedes Vito ECM Problems, Mercedes Vito ECU Faults, Mercedes Vito ECU Testing + Repairs by smartAjaz. Bookmark the permalink.